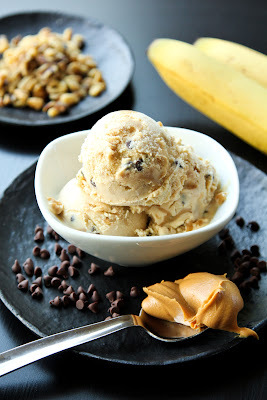 Peanut Butter Chunky Monkey Ice Cream - Hi, friend Popular Recipes, in this article entitled Peanut Butter Chunky Monkey Ice Cream, we have prepared this article well and concise to be easy to understand for you to read and can be taken inside information. hopefully the contents of the post Article baking challenge, Article food, Article GYCO, Article ice cream, Article peanut butter, Article recipe, that we write this you can understand and useful. okay, happy reading. A couple of weeks ago I signed up for the Get Your Chef On Challenge over at White Lights on Wendesday. Since participating in the Unique Sweet Challenge I've discovered that I really enjoy doing these sorts of things, especially when you get to see all of the yummy treats everyone else has made! This month's secret ingredient was peanut butter, Jenn couldn't have picked it any better. I love peanut butter almost to the point of obsession. It's incredibly versatile and can be used in both savory and sweet dishes. Of course I immediately wanted to make ice cream. I've been dying to make peanut butter ice cream so this was the perfect opportunity. Since I had some spotted bananas lying around, I decided to make it Peanut Butter Chunky Monkey Ice Cream. I started off by slicing the banana, tossing it in butter and brown sugar, and baking it for about 40 minutes. I chopped it up and transferred it to the freezer to chill. Then I made a simple no-cook base. You just put everything in a blender and give it a go. Once it's nice and smooth you add a pinch of salt and some vanilla. Then mix for another minute or two. Since the base is already cold, there's no need to chill it. Just pour it into your ice cream maker (I use the KitchenAid attachment) and start churning! Meanwhile chop your walnuts, measure out your chocolate chips and get that peanut butter ripple going. I like to microwave it in a small bowl and whisk it over an ice bath to cool it down. 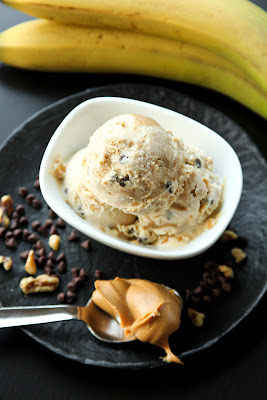 Once the ice cream has finished churning (25-30 minutes) fold in the bananas, walnuts, and chocolate chips. 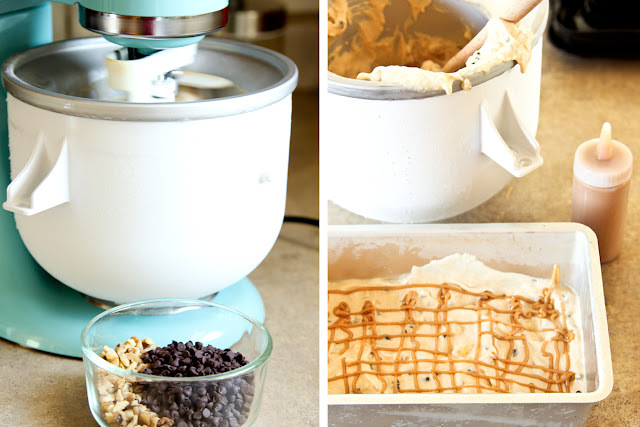 Pour the ice cream into a freezer safe container and layer it with the peanut butter swirl. Toss it in the freezer and let it set up for about 3-4 hours... I know, but you really do have to wait! Once it has set up, scoop and enjoy! 1. Preheat oven to 400 degrees. Line one baking sheet with foil. Cut banana into slices and toss in a bowl with melted butter and brown sugar. Spread banana slices on sheet and bake for approximately 40 minutes. Remove from oven and chop into small chunks. Place in a freezer safe container and freeze until needed. 2. Assemble blender. Pour half & half into blender. 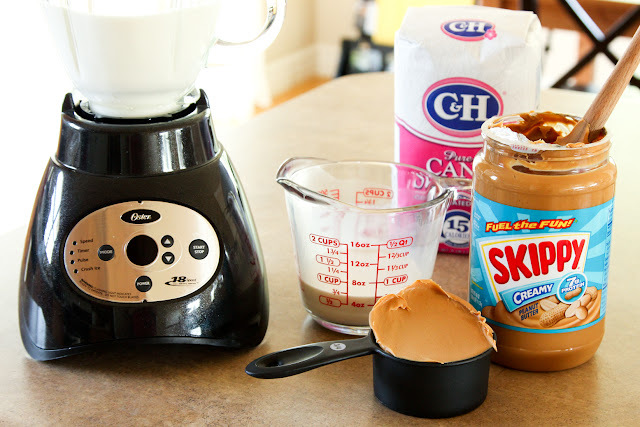 Then add peanut butter and sugar. Blend for 2-3 minutes or until mixture is smooth and creamy. 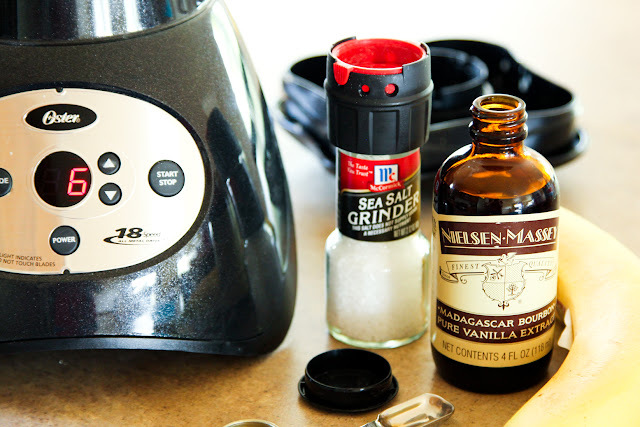 Add salt and vanilla, blend for an additional minute. 3. Pour mixture into ice cream maker. Churn according to manufacturers instructions (about 25-30 minutes). Meanwhile prepare the peanut butter swirl by combining ingredients in a small microwaveable bowl. Heat for 1 minute on high. Place over an ice bath and whisk until cool. Set aside. 4. Chop walnuts and measure out chocolate chips. Remove bananas from freezer. Once mixture has churned, remove bowl and fold in bananas, walnuts, and chocolate chips. Pour ⅓ of the mixture into a freezer safe container. Drizzle peanut butter over top. Continue repeating these steps until all of the ice cream and peanut butter has been layered. Place in freezer and chill for 3-4 hours before serving. Thank You and Good article Peanut Butter Chunky Monkey Ice Cream this time, hopefully can benefit for you all. see you in other article postings.